An exquisite bridal ring set for a beautiful bride. Both rings are carefully crafted in 18ct yellow gold and adorned with dazzling diamonds. The engagement ring features as the statement piece, showcasing a captivating cushion cut diamond centre surrounded by a double halo of smaller brilliant diamonds. The total diamond weight for this bridal set is 1ct. 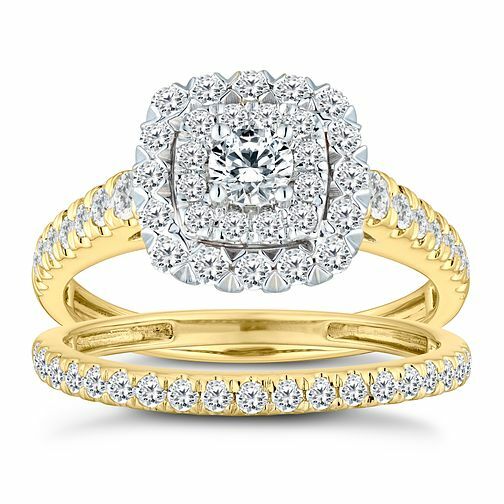 18ct Yellow Gold 1ct Diamond Cushion Bridal Ring Set is rated 5.0 out of 5 by 1. Rated 5 out of 5 by Anonymous from Beautiful and very sparkly The picture does not do this ring set justice. They are very sparkly and a nice size. The band ring is more delicate than I expected but it is very sparkly and fits perfectly with the main ring.I was bought it for an Anniversary present and I love it.